Ref Pierluigi Collina, perhaps the coolest head on the field at the Cup. How do you rate it? Brazil are the only country to have made it to 3 consecutive finals of the World Cup. 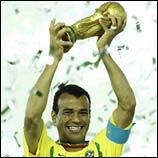 In 7 Cup finals, Brazil have lifted the Cup 5 times. While Germany have won the Cup thrice in 7 final appearances. A compilation of the best links on the World Cup. The 2002 World Cup clearly demonstrated the 'Beautiful Game' that soccer is. A celebration of some of the finest moments of the month-long tourney. Ronaldo scored twice in the second half to give the South Americans a 2-0 victory over Germany in the final. Dressed head-to-toe in the green and yellow of the national flag, fans jostled to get a glimpse of the champions as the beaming players emerged from a chartered plane. South Korea which bagged fourth place at the Cup feted its team with a parade and medals to the squad and coaches. Dutch coach Guus Hiddink was presented with honorary citizenship. Jose Camacho who took over as coach in 1998 quit after 4 years in charge. Spain were knocked out by co-hosts South Korea in the quarter-finals of the Cup. 'We thought the referee in the final wouldn't be from Europe since Germany is a European country, but FIFA nominated an Italian for the job,' said World Cup referee Ali Bujsaim from United Arab Emirates. Turkish players who claimed third place at the Cup received a heroes welcome on their arrival. Their plane was escorted by an F-16 fighter jet. Also, commemorative coins are to be minted in their honour. The Argentine football legend dismissed Brazil as a "mediocre" team who were lucky to win the World Cup. 'I don't think we'll be going to work tomorrow after so much partying,' said Claudi Mary Sampaio, 27, on the streets of Porto Seguro, the birthplace of Brazil. Elsewhere, the wild celebrations resulted in three fatal shootings. Commentators in Brazil fear the historic Cup win will strengthen the positions of directors in the Brazilian Football Confederation blamed for the shambolic state of affairs. Kahn came in for scathing criticism for his fatal mistake which resulted in the first goal. "One mistake is a mistake too many," read the headline in Munich's Sueddeutsche Zeitung. Japan and South Korea on Monday applauded their success in co-hosting Asia's first World Cup. Do you think the Cup was a success? Why?